Today we are talking smoothies. Smoothies have become one of my favorite forms of breakfast, lunch, or snacks. There are days where I have a hard time slowing down, unfortunately that means not taking the time to make a decent breakfast or lunch for myself. Dinner, on the other hand, is our golden time. Sure, there are days where I am rushing around the kitchen trying to put a meal together, but I do my best to make sure there’s a meal (hopefully a decent one) on the table for my family to devour after their busy day. To make life a little easier on myself, I’ve gotten in the habit of keeping plenty of smoothie ingredients in the house. I have no particular pattern to my smoothie making. I just buy whatever fruit is on sale or what fruit looks fresh. That means buying a whole pineapple because it just looked good (and I never buy whole pineapples), or finally stopping at the avocado stand I drive by every single day on the way home. It’s hard to ignore a sign that says ‘Giant bags of avocado’s for $5’. One thing I always to do is freeze my bananas. I like to buy tons of bananas and put several aside for smoothies. I chop them up and store them in a freezer bag. They always make the best smoothies. 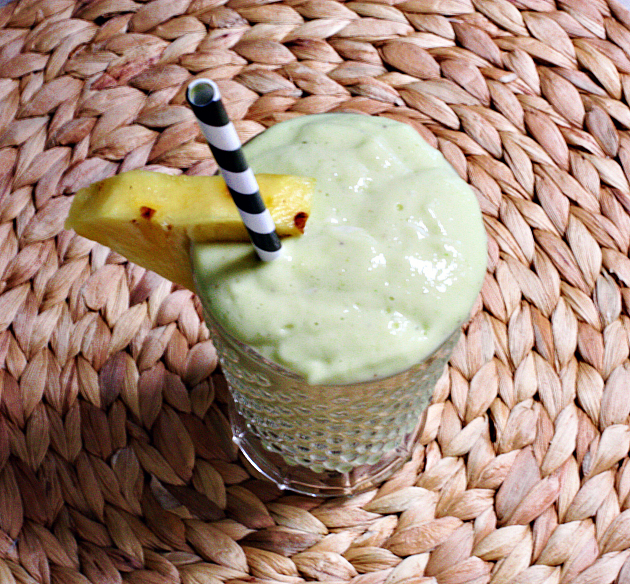 This Tropical Pineapple Avocado Smoothie is delicious, easy to make, and full of nutrition. It’s a quick and easy way to satisfy a hungry belly. 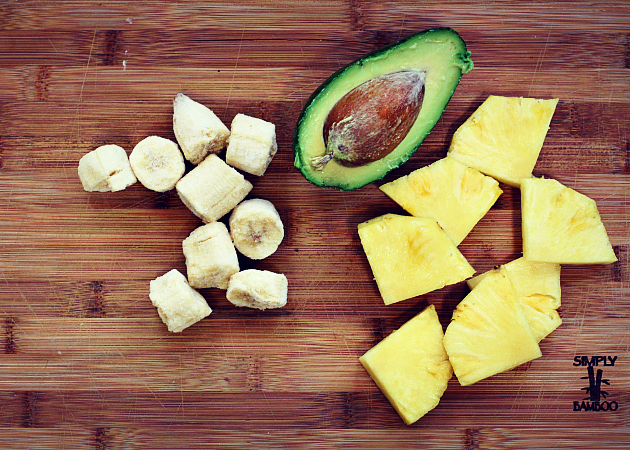 Place all ingredients in a high speed blender. If all your ingredients are fresh you may want to add 1/2 of ice to thicken the smoothie. Blend all ingredients on high speed until smooth. Pour in a glass and enjoy! Thanks Maryea! Hope it warms up for you soon! 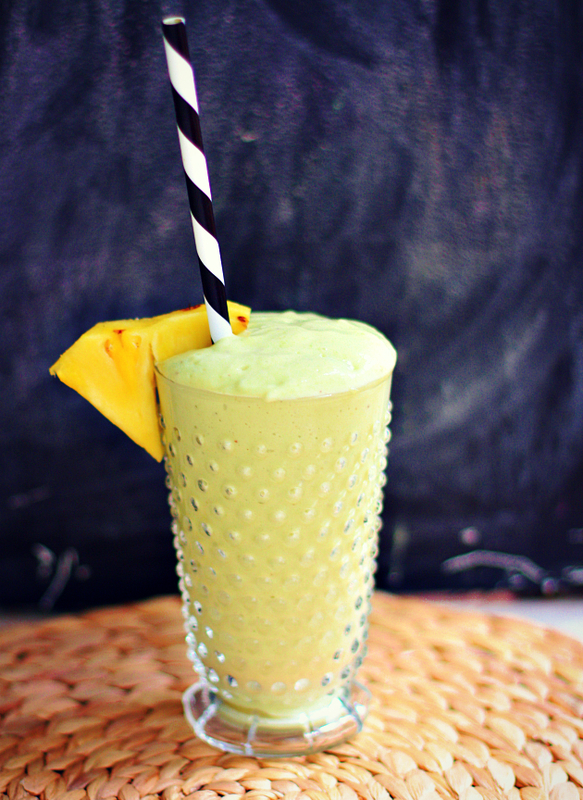 This looks delicious and I’ve never put an avocado in my smoothie. I need to try it! Hi Kelli! I love putting avocado in my smoothies. It gives them a creamy texture.